In this note we present a general approach to construct large digraphs from small ones. 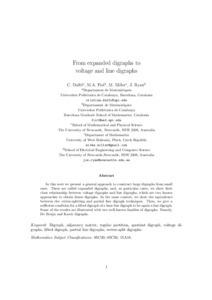 These are called expanded digraphs, and, as particular cases, we show their close relationship between voltage digraphs and line digraphs, which are two known approaches to obtain dense digraphs. In the same context, we show the equivalence between the vertex-splitting and partial line digraph techniques. Then, we give a sufficient condition for a lifted digraph of a base line digraph to be again a line digraph. Some of the results are illustrated with two well-known families of digraphs. Namely, De Bruijn and Kautz digraphs. Dalfo, C., Fiol, M., Miller, M., Ryan, J. "On quotient digraphs and voltage digraphs". 2016.